Educators demanding fair pay and quality public education for students in Los Angeles (left) and Denver (right). This week, unionized educators from Los Angeles and from Denver’s progressive Caucus of Today’s Teachers met in 21st-century style. We held a video conference call together with support from Labor Notes and several other allies from across the country, covering four time zones. The United Teachers of Los Angeles (UTLA) is currently led by members of the progressive, social justice caucus Union Power, a founding member of the United Caucuses of Rank-and-File Educators (UCORE), and Denver educators can learn much from Union Power’s journey to leadership of their union as well as the journey of UTLA educators to their successful January 2019 strike. Our meeting had multiple goals: to share strategies for organizing within the union and out in the community, to reflect on challenges and successes, and to build and maintain solidarity across the country to continue the work towards the public schools our students deserve. 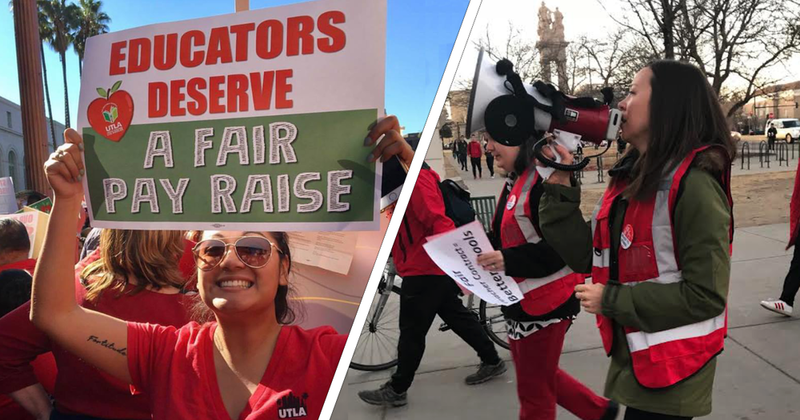 For us Denver educators, it was revitalizing and motivating to converse with the educators and union organizers of Los Angeles whose strike was months in the making. Like the educators in Los Angeles, we know that authentic support from community members, students, and parents is essential for any successful changes to take place. Events and strategies such as community meetings and forums, online organizing, and talking with parents and students in person about issues they want to address in their local schools is key to building power and unity. Denver’s current policy of school choice, in which students often attend school outside the neighborhoods where they live, poses a challenge in building local community support. However, activists can strive to benefit from organizing under this policy so that information often spreads from school communities to neighborhood communities and across the city quickly. When we learned that Los Angeles teachers had been in strike prevention / planning / preparation mode for more than five months leading up to their January 2019 strike, we felt both empathy and encouragement. No educator - or parent or student or community member - hopes for a strike. However, after nearly a year and a half of negotiating with some progress, multiple deadline extensions, and the threat of state intervention, a strike is often the last best option when all others have been exhausted. Building and keeping up union members’ motivation and energy during periods of extended waiting and frustration is difficult, but in our conversation we all agreed that the best action educators in this situation can take is to support each other and continue engaging community members in the work. Because each teacher union across the country is unique, it’s up to members to come together to share their visions for what a member-driven union can look like and accomplish. Union members are more motivated to persevere through the long struggle before a strike when they are empowered to lead and are supported by their fellow members and union staff. Our beliefs about the value and purpose of member-driven unions were reinforced and given new life after this week’s discussion with the powerful educators from UTLA and the allies at Labor Notes - thank you all for your solidarity and support. Newer PostOur Strike Is Over. Now It’s Time For Equity-Focused Leadership In Our Union And On Our School Board.